02. J Majik feat Kathy Brown - "Share The Blame"
03. Futurebound & Jaquan - "Billy The Kid"
04. J Majik & Wickerman - "New Badness"
05. 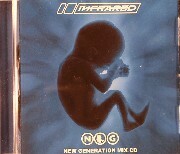 J Majik & Sonic - "New Generation"
06. Cookie Monsters - "Keep It Coming"
07. Infrared vs Gil Felix - "Capoeira"
08. J Majik - "No Badness"
09. Cookie Monsters - "The Clown"
10. J Majik, Futurebound & Wickerman - "Pit Bull"
11. J Majik & Wickerman - "Elephant"
13. Wickerman - "Good Vibes"
14. Futurebound & Codec - "Flat Spin"
15. Futurebound & Codec - "Pied Piper"